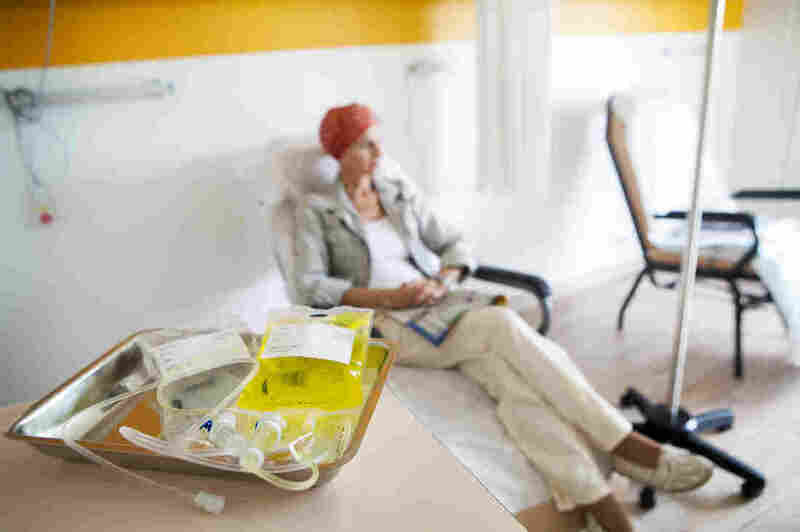 Cancer Plus Chemo Might Put Your Job At Risk : Shots - Health News Four years after women with jobs were diagnosed with early-stage breast cancer, nearly one-third were unemployed. But it's not clear how much of that was due to illness or to a sour economy. Imagine that you've just been told you have cancer. The good news is that it's early stage. Still, your doctor believes a course of chemotherapy would boost your survival odds. Then this week you read the headline, "Chemo for breast cancer increases unemployment risk." The buzz about the impact of cancer and chemo on jobs is emanating from a study by Dr. Reshma Jagsi, a professor in the University of Michigan department of radiation oncology. "I expect patients to have difficulties with employment during treatment," she told Shots. But many doctors believe the patients will "bounce back." Do they really? she wondered. Jagsi's study, published online this week in the journal Cancer, tracked 746 early-stage breast cancer patients in Detroit and Los Angeles. They were all under age 65 and employed at the time of diagnosis. Some had chemotherapy. Some did not. Four years after they were diagnosed with cancer, the women were asked how they fared in the workplace. Nearly a third were no longer working, not necessarily by choice. In that group, 55 percent said they wanted to work and 39 percent were job hunting. Chemotherapy made matters worse. Thirty-eight percent of women who had chemo were unemployed, compared with 27 percent of women who didn't have chemo. "It could be these women had long-term side effects," Jagsi speculates. The study found that women's level of education or income didn't make a difference. Neither did the patients' race. But those with greater workplace support — paid sick leave, flexible schedule options — were less likely to have lost their jobs. The survey looked only at breast cancer patients because the success in treating this cancer ensures a large pool of survivors to follow. That's also the case for prostate cancer, Jagsi says, but she wanted to look at the role chemotherapy might play, "and men with early-stage prostate cancer don't usually get chemo." Like many studies, this one raises a lot of questions. Could the findings discourage some women from choosing chemotherapy? "This is not intended to scare women off of chemotherapy they need," Jagsi says. For some patients, chemo will offer a substantial benefit. For others, the benefit is relatively small. When those latter women weigh chemo, she says, it's reasonable to consider long-term impact on employment. Then again, what one woman might consider a small benefit from chemo — for example, a 4 percent boost in survival odds — another woman might consider important. "Some women decide the risk is low enough and are fine with that decision," says Jean Sachs, CEO of Living Beyond Breast Cancer, an education and support organization. "Others are really anxious a year later." And there is no right or wrong answer. "I often talk to women and tell them, 'Figure out what for you is the worst possible outcome and make the decision that avoids that,' " says Hester Hill Schnipper, chief of oncology social work at Boston's Beth Israel Deaconess Medical Center and author of After Breast Cancer: A Common-Sense Guide to Life After Treatment. Don't some women work during and after chemo and do just fine? Yes, they do. "We work hard with patients to help them dovetail their treatments in a way to still be able to work if needed and desired," wrote Lillie Shockney in an email. She's the administrative director of the Johns Hopkins Cancer Survivorship Program. Even if the medical team isn't tuned into workplace issues, a patient can bring them up. For a patient who does want to work during treatment, Rebecca Nellis, vice president of programs and strategy for Cancer and Careers, suggests a conversation touching on side effects (how long after a treatment will they appear?) and scheduling options (Friday might be a good day if chemo side effects come within 24 hours but not if side effects are delayed). Her group offers programs, publications and interactive Web features for patients. "You don't have a choice about getting cancer, you might not have a choice about treatment, you might not have a choice about work," Nellis says. "But for us it's about how to create a better path to making a decision, even if it isn't a perfect path." Aren't there laws that can help? The Americans with Disabilities Act and the Family and Medical Act do offer protections, says Nellis. But the ADA only applies to businesses with 15 employees or more. For the FMLA, the number is 50. "For people who work for small employers these laws can be out of reach," she says. And employers often have different policies about how much sick leave an employee can take, affecting everyone from a CEO to a hotel housekeeper. Maybe the women who lost a job didn't lose it because of cancer. It could be the economy is to blame. Nagsi writes that the study "lacked information regarding the employment outcomes of women without cancer during the time of the current study." In future research, she'd like to look at the financial and employment consequences of a breast cancer diagnosis when there's not an active recession going on. Then there are issues of age and gender bias. "Breast cancer is a disease of older women, and we know how much harder it is for older people to find work," Schnipper says. For patients who are unhappily unemployed after treatment, Schnipper has come up with a sentence to explain a cancer-caused absence from the workforce: "You will notice in my resume there is a gap of a [fill in the time frame]. That's because there were some medical issues within my family but everything is fine now." That's no lie, Schnipper says, because "you're a part of your family." An interviewer can't pry further because of privacy concerns. And some breast cancer survivors do decide to walk away from a job. "The diagnosis makes women think maybe they want to try something different," says Sachs. Perhaps some of the women in the study tried a new kind of job, she says, and it just didn't work out. But other women say they're doing their best to find work after cancer, and not succeeding. Two years ago, Rosalie Weener of Chestnut Hill, Mass., learned that she had bilateral breast cancer — a tumor in each breast. Each cancer was a different type. Her doctor prescribed "a lot of chemo — 16 treatments." The office manager went on long-term disability for six months, earning 60 percent of her salary. She says she was planning to return to work when she got a call: She was being laid off. Now age 66, Weener, who wasn't part of the study, feels traumatized by both the cancer diagnosis and the layoff. She goes on job interviews and feels "panic, nervous about what if I got the job and it wouldn't work out." Then again, she says, "I haven't gotten the jobs anyway." The new study shows that in her cancer-related misery, she very likely has lots of company.